Action Factor’s Read-and-Sing phonics books build reading and writing skills for beginning readers with the help of some special friends--Amos, Eli, Ivy, Otis, Uri, and Yvette. These lovable characters keep students smiling as they follow along in the book and join in the lively phonics learning songs. The sing-along CDs feature 2 tracks 1 vocal and 1 instrumental. After a bit of practice with the vocal track, students can perform the song using just the instrumental track. And because students learn best when they can apply what they know, creative activities for reinforcing the phonics sounds and concepts are included with each book. Read-and-Sing books are whimsically illustrated in full color soft cover format and build phonemic awareness through music. Priced for convenience and economy, the Read and Sing Complete Collection includes all eleven Read-and-Sing Books with their music CDs at a price that is lower than the cost of the individual collections or books, if purchased separately. This collection provides a foundation in phonemic awareness that is crucial to early literacy, an excellent enhancement for Sing Your Way Through Phonics Vol. 1 Combo! See individual book titles below for descriptions. Order Read and Sing Complete Collection online ($74.95), or print an order form to mail/FAX. Priced for convenience and economy, the Letters and Sounds Collection includes six Read-and-Sing Books and six music CDs at a price that is lower than the cost of the six books, if purchased separately. This collection provides a foundation in phonemic awareness that is crucial to early literacy, an excellent enhancement for Sing Your Way Through Phonics Vol. 1 Combo! See individual titles below for descriptions. Order Letters and Sounds Collection online ($44.95), or print an order form to mail/FAX. Priced for convenience and economy, the Early Words Collection includes five Read-and-Sing Books and five music CDs at a price that is lower than the cost of the five books, if purchased separately. This collection provides a foundation in phonemic awareness that is crucial to early literacy, an excellent enhancement for Sing Your Way Through Phonics Vol. 1 Combo! See individual titles below for descriptions. Order Early Words Collection online ($39.95), or print an order form to Mail/FAX. The Read and Sing Complete Literacy Center Collection can accommodate classroom listening stations where up to six students can listen to the same CD, while each of the students follows the CD in his/her own book. This collection includes 66 Read-and-Sing Books (11 different books, 6 copies of each book) and eleven music CDs at a reduced price. The Read-and-Sing books provide a foundation in phonemic awareness that is crucial to early literacy, an excellent enhancement for Sing Your Way Through Phonics CDs and Mini-Charts! Order Read and Sing Complete Literacy Center Collection online ($349.95), or print an order form to mail/FAX. The Letters and Sounds Literacy Center Collection can accommodate classroom listening stations where up to six students can listen to the same CD, while each of the students follows the CD in his/her own book. This collection includes 36 Read-and-Sing Books (6 different books, 6 copies of each book) and six music CDs at a reduced price. This collection provides a foundation in phonemic awareness that is crucial to early literacy, an excellent enhancement for Sing Your Way Through Phonics Vol. 1 Combo! Order Letters and Sounds Literacy Center Collection online ($194.95), or print an order form to mail/FAX. The Early Words Literacy Center Collection can accommodate classroom listening stations where up to six students can listen to the same CD, while each of the students follows the CD in his/her own book. This collection includes 30 Read-and-Sing Books (5 different books, 6 copies of each book) and five music CDs at a reduced price. This collection provides a foundation in phonemic awareness that is crucial to early literacy, an excellent enhancement for Sing Your Way Through Phonics Vol. 1 Combo! Order Early Words Literacy Center Collection online ($164.95), or print an order form to mail/FAX. Click on the cover to look inside the book! Meet the Lit Kids introduces readers to the cast of characters they will meet in the Read-and-Sing series. With names that help students remember the vowels, Amos, Eli, Ivy, Otis, Uri, and Yvette invite youngsters to join in the fun as they learn about letters, sounds, and words. Children will come to love these rascally animals as they frolic through each book and song in the Read-and-Sing series, providing a visual component to reinforce important concepts about reading and writing. Save on this book and others with one of our Book Collections or Literacy Center Collections. Take a look inside Meet the Lit Kids. Listen to a Meet the Lit Kids audio sample. Order Meet the Lit Kids book and CD online ($9.95), or print an order form to mail/FAX. Have you ever noticed that the letter C is shaped like an ear or that the letter S looks like a snake? This Read-and-Sing book is a different kind of alphabet book. Alphabet Letters, helps students learn to recognize capital letters by likening letter shapes to familiar objects embedded in the illustrations. As students sing along with the recording, they can trace the hidden letters, writing capital letters with their fingers. From there, it’s but a small step until students know the letter shapes well enough to draw them on their own. Because teaching phonemic awareness begins with recognizing letters, additional activities for learning capital letters are suggested such as finger-drawing on partners’ backs, identifying plastic letters in a bag by feeling them, and shaping capital letters with rolled clay. Save on this book and others with one of our Book Collections or Literacy Center Collections. Take a look inside Alphabet Letters. Listen to a Alphabet Letters audio sample. Order Alphabet Letters book and CD online ($9.95), or print an order form to mail/FAX. Some lower-case letters like c, s, and z are easy to recognize since they look like their capital letter partners - C, S, and Z. But lower-case letters like b, d, and e are harder to recognize because they look very different from capital B, D, and E. The Read-and-Sing book, Little Partners, is an alphabet book that helps students learn to recognize the lower-case letters that look different from their capital letter counterparts. Linked to a circus theme, the snappy sing-along describes each letter in terms of its component parts - sticks, holes, poles, curls, humps, and curly poles. Additional suggested activities for learning the lower case alphabet include helping students to match upper and lower case letters, assembling and disassembling lower case letters, and finding lower case letters in printed material. Together with Alphabet Letters, Little Partners provides motivational reading instruction material in alphabet recognition (capital and lower case letters) for kindergarten readiness. Save on this book and others with one of our Book Collections or Literacy Center Collections. Take a look inside Little Partners. Listen to a Little Partners audio sample. Order Little Partners book and CD online ($9.95), or print an order form to mail/FAX. When readers look at the letters in an unfamiliar word, they need to recall the corresponding sounds. Conversely, when writers think of sounds in a word they wish to write, they need to recall the corresponding letters. The playful shopping antics in What’s That Sound? may elicit giggles as students build letter/sound matching skills with familiar grocery items. Children can point to appropriate items (ex. bread, doughnuts, and flour for the sounds of b, d, and f) as they sing along. Save on this book and others with one of our Book Collections or Literacy Center Collections. Take a look inside What’s That Sound. Listen to a What’s That Sound audio sample. Order What’s That Sound? book and CD online ($9.95), or print an order form to mail/FAX. Name Those Vowels helps students learn to recognize and remember an important set of letters needed for reading and writing-the vowels. But before learning vowel rules, students must be able to instantly recognize the vowels in both capital and lower-case forms. To help them do just that, readers can point to the vowels imbedded in this book’s illustrations while singing a playful song set to the folk tune, Bingo. Each time a vowel is omitted, singers can clap, rap, stomp, or add a favorite body movement. Save on this book and others with one of our Book Collections or Literacy Center Collections. Take a look inside Name Those Vowels. Listen to a Name Those Vowels audio sample. Order Name Those Vowels book and CD online ($9.95), or print an order form to mail/FAX. Children quickly learn the short and long vowel sounds as they sing and point to the comical illustrations in Oh, Do You Know? Examples: When students sing, “Oh, do you know the short a sound?”, they can point to cats, apples, ants, an ax, a hat, and a basket. For long a, they find Amos, a radio, a May calendar, a table, a cake, maple syrup, grapes, and plates. Once students become aware of the vowel sounds in words, they can draw their own short and long vowel pictures or create interesting vowel collages from magazine cut-outs. Save on this book and others with one of our Book Collections or Literacy Center Collections. Take a look inside Oh, Do You Know. Listen to an Oh, Do You Know audio sample. Order Oh Do You Know book and CD online ($9.95), or print an order form to mail/FAX. Take a look inside Spelling Families. Listen to a Spelling Families audio sample. Order Spelling Families book and CD online ($9.95), or print an order form to mail/FAX. Two Little Letters helps students learn to recognize and spell consonant digraphs: th, ch, sh, ph, kn, and gn. Song lyrics incorporate these important letter pairs in beginning, middle, and ending positions within words. As readers sing along with the lively song set to the folk tune The Bluetail Fly, they can follow clues in the illustrations and point to each digraph word. Once the students have become familiar with the digraphs in this song, they can use the instrumental track to substitute their own digraph words. Save on this book and others with one of our Book Collections or Literacy Center Collections. Take a look inside Two Little Letters. Listen to a Two Little Letters audio sample. Order Two Little Letters book and CD online ($9.95), or print an order form to mail/FAX. 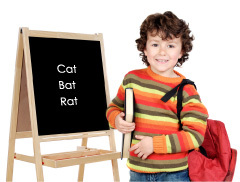 Talking and Walking helps students learn to recognize and spell words that follow the rule, “When two vowels go walking, the first one does the talking.” The target words follow a c-v-v-c (consonant-vowel-vowel-consonant) pattern where the first vowel is long and the second is silent. Characters in a camping story act out the rule in the course of their adventure. Once the students have become familiar with the long vowel words in this song, they can use the instrumental track to substitute their own c-v-v-c words. Examples: ea-bean, ee-peek, ai-mail, oa-goat. Save on this book and others with one of our Book Collections or Literacy Center Collections. Take a look inside Talking and Walking. Listen to a Talking and Walking audio sample. Order Talking and Walking book and CD online ($9.95), or print an order form to mail/FAX. Silent E helps students learn to recognize and spell words with c-v-c-e (consonant-vowel-consonant-silent e) patterns. By comparing words before and after adding a final e, students see how the sound of the middle vowel changes from short to long. By following the Lit Kids’ sign painting adventures, readers can begin to predict the complete word under the covered portion of the sign by applying the silent e rule. Once the students have become familiar with the short and long vowel words in this song, they can use the instrumental track to substitute other words that change when a silent e is added. Examples: mad/made, slid/slide, not/note, cub/cube. Save on this book and others with one of our Book Collections or Literacy Center Collections. Take a look inside Silent E.
Listen to a Silent E audio sample. Order Silent E book and CD online ($9.95), or print an order form to mail/FAX. Outlaws helps students learn to recognize and spell words that do not follow short and long vowel rules. For example, one rule states that a single vowel in the middle of a word is usually short. Exceptions-told, cold, hold. Another rule states that the first vowel in 2-vowel words is usually long. Exceptions: bread, thread, head. Comical illustrations show students how to recognize “outlaw gangs” in words by noticing the vowels and letters that follow. Once the students have become familiar with the irregular words in this song, they can use the instrumental track to substitute their own outlaw words. Examples: 3-letter patterns-there, where; 4-letter patterns-could, would; 5-letter patterns-caught, taught. Save on this book and others with one of our Book Collections or Literacy Center Collections. Take a look inside Outlaws. Listen to a Outlaws audio sample. Order Outlaws book and CD online ($9.95), or print an order form to mail/FAX. Was it too many Christmas cookies? Was it too much eggnog? Whatever the reason, Santa is stuck, and the situation seems hopeless. Little did Santa know that events earlier that day would eventually lead to his rescue! This delightfully illustrated cumulative tale of Christmas mishap is a take-off on the familiar nursery rhyme, The House That Jack Built. With text that guarantees successful reading, even for beginners. It’s easy for beginners to read along as each new page recaps all the familiar links to Santa’s dilemma. ; Children love to dramatize the characters as the story winds around to its amusing conclusion. Teachers tell us it’s a real favorite for read-aloud’s and shared reading. Why not share the fun of this Christmas book for children with a special youngster this holiday season? Take a look inside When Santa Got Stuck in the Chimney. Order When Santa Got Stuck in the Chimney book online ($6.95), or print an order form to mail/FAX.